Good morning, friends! 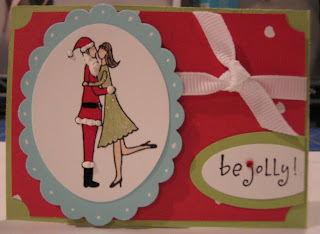 I wanted to share this cute card with you ... 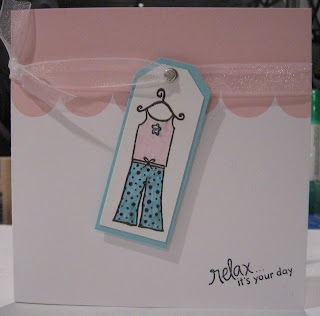 I just love the shopper girl, and when I look at this sentiment, I see "have a SPEND-iferous day!" Perfect for a day of shopping or a birthday wish! I colored my girl in with my Copics - I'm getting better with them - now I just want more to expand my options! I'm off to enjoy a day of fun at work! I hope you all have a great day! 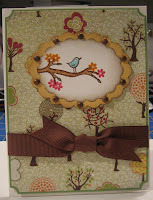 Notecard, stamps by A Muse, ribbon by Paper-Source, eyelets by We Are Memory Keepers. My birthday was last month! I would have liked to forget it, but all these beauties came in the mail and just kept reminding me! Thanks so much to my friends and the great gals at the A Muse Addicts Yahoo group! I feel so loved! 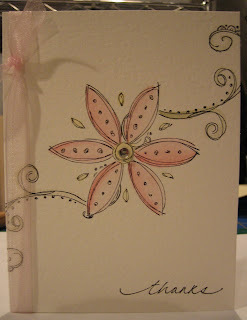 Pretty Birthday card from Jennie (mocjen on SCS)! Love the color combo! 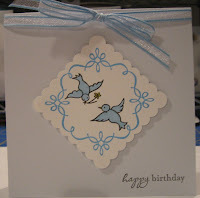 Birdy Birthday card from Penny Hall! The A Muse ribbon is so shimmery and I love the punch turned on it's side! 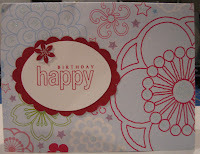 Sparkly patterned paper made into a really cool card from Ingrid (ottchix on SCS). An AMAZING stampy birthday from Rhonda! A perfect card! This beauty is from my bestest friend, and partner in all things crafty, Sarah! She is just amazing! The level of detail, the composition - it just blows my socks off!! AND, she gave it to me on time (I can never seem to hit all of those things!)!! She is an amazing stamper, and an even better friend! I feel so blessed to have her in my life! 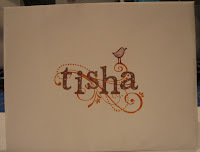 This is the beautiful envelope that came with my card from Sarah! I have a few more to share ... I'll get them next time! Have a great day! Big Cyber Thank you card! I just wanted to say a big thank you to all of my cyber friends for the well wishes and support in the past week or so! For those of you who don't know, my older brother died 2 weeks ago today. He had been sick for a while, and I knew it was going to happen sooner or later, but it was still a bit of a shock when he died. We have been doing pretty well ... sometimes you just have to keep going! I just want you all to know how much I appreciate your support - the cards, the prayers - it really does make a difference. This sad situation does make me take a moment to appreciate all the people in this world that love me and my family ... so thank you! 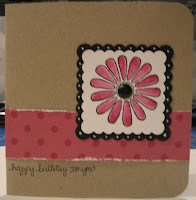 Details on this card - Stamps by SU and A Muse, CS from Papersource, ribbon by SU - colored with SU classic inks and an aquapainter - there is a bit of bling in the center of the flower! I am pretty sure that I saw someone else do a similar card to this when Doodle This first came out - I'm sorry I don't know who! If you do, please let me know so I can give credit! Somehow, the time got away from me on these swaps for Tracy (check out her great blog here! ), but they are in the mail now and will hopefully arrive in time! So, if you are in group 1 or group 4 and want to be surprised, then stop now! Details - Stamps by A Muse, CS by SU, ribbon by SU, punches by SU and Marvy, Paper by Paper Source, Liquid applique, Creative Candy by A Muse. Details: Stamps by A Muse, CS by SU, brads by ??. I can't wait to see what everyone else has come up with! Now, I really need to get to work on my ATC album!! Thanks for stopping by my blog today! Think simple, think A Muse! 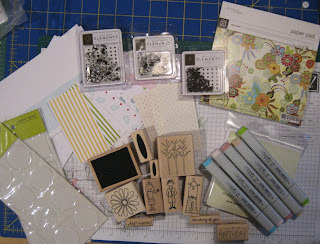 I spent a bit of time last week with some of my new goodies from my trip to the Northwest! I was trying to remember all the goodness of A Muse - simple, elegant, easy! I also wanted to play with my new Copics - what the heck was I thinking spending that kind of moolah on markers that I REALLY don't know how to use? I guess I was using the wrong ink ... I will try them again when my frustration wears off! So, here's a few pics, and a shot of the goodies that I picked up on my trip! It really is amazing when I go shopping somewhere outside the KC area ... makes me realize just how limited our shopping options are here! 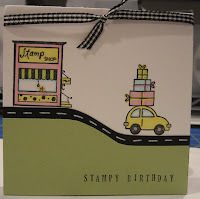 I did see somewhere that there is a stamping store in Lee's Summit - The Stamp Patch - I had heard of it a few years ago, but not lately so I just assumed it had closed! Anyone know anything about it? 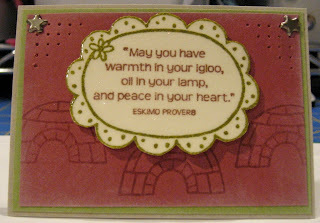 Stamps by A Muse, Notecard by A Muse, CS by SU!, blurry image courtesy of my new Copics! 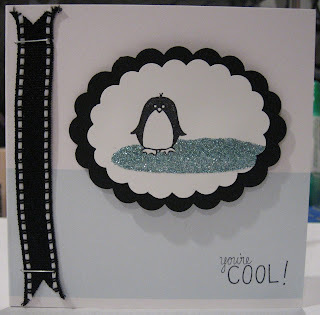 Stamps by A Muse, ribbon by May Arts, notecard by A Muse - oh look, another product that I am not very good with - slightly bumpy pond for my baby penguin courtesy of my Glue Pad. This card I was actually 100% pleased with! Love Florence, love my new blue (can't ever remember what size that is!) scallop circle, love the soft sky with the ruby red - this one just made me happy! Unfortunately, it left the house the same day I made it - off to the hospital with my mom for our friend! I may have to make another one just for me! 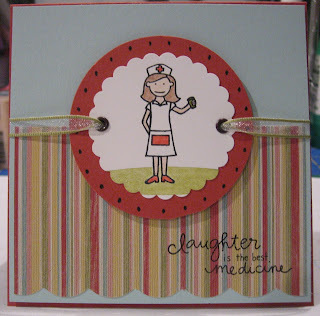 Stamps by A Muse, CS by SU!, Ribbon by A Muse, eyelets by Making Memories. Here are my goodies! I think I showed a lot of restraint ... okay, a little bit of restraint! That new Basic Gray pad - Mellow - is just gorgeous!! Thanks for sticking with me, blogland friends! I am going to try to post more often! Things are starting to settle down! I have just started homeschooling my 10 year old, so we are in a big adjustment phase around here! Things are going well ... there has only been a few minutes when all three kids were crying! !